FREE Demo Class for those new to Zumbini™, Thursday March 14, 9:30-10:15. Register as space is limited! $83 for your first child, $24 for additional siblings, offered in 6 week sessions. Siblings 9 months and younger attend for free! 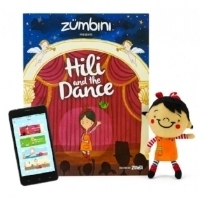 You receive a Zumbini Bundle® - 20 original songs on a CD , access to streaming music and TV Show on the Zumbini® app, a plush doll of the main character, and a beautifully illustrated song book with enhancement information! *Those that have attended a session, with the same Zumbini Bundle®, may receive a large plush Sing and Play Hili Doll. Please contact Sheryl before you register and pay. If you miss a class, you are able to attend at another time to make up. Each paid family receives their Zumbini® Bundle at class. Sing, dance, & play as you bond with your child. Zumbini® is a music and movement class for children, 0 to 4 years, to attend with their fun-loving caregiver. Created by Zumba® and BabyFirst™ . Zumbini® combines original Zumba®-style music with dancing, acoustic singing, rhythmic instruments, scarves, and more to create this fun and engaging 45-minute class. Zumbini® class music was created by Grammy nominated musicians. Sheryl Haynes is your Certified Zumbini™ Instructors, and the first in Kansas! In addition to a love of music and movement, we want children to develop stronger bonds with their caregivers and socialization with new friends. There are many opportunities to sing together, dance together, and laugh together throughout this class. The Zumbini Bundle® continues the fun learning at home. Zumbini® is not an exercise class but we do get up and down off of the floor, and move to the Zumba® inspired early childhood music. Dress for movement and wear tennis shoes. No food or drinks in the studio. There is a smaller room for that. We encourage parents to turn off cell phones and leave them in the other room. Talking is limited to before and after class but singing is highly encouraged. Your connection and time enhances your child's experience! As they spend time with the instructor, other children, and other caregivers in class! The interactive nature of our live class and mixed-age format ensures highly impactful social interaction for children of this age range. In addition to singing about how we feel, the variety of tempos and rhythms in our music will cause your child to feel a wide range of different emotions during class, stimulating their emotional development at this critical age. Just like Zumba created "fitness in disguise," Zumbini has done the same for early childhood education and family bonding...we make it FUN! Not exercise "per se", we estimate that parents burn between 100–200 calories in a 45 minute class. Our unique curriculum, which leverages a carefully - calculated balance of movement and seated musical activities, drives development for the child while keeping both children AND their caregivers fully engaged throughout the entire class. We want to see you in our Zumbini classes! A new family may attend one FREE Demo/Trial Class, during the first weeks of a session. This is a one time opportunity. Registration is required to attend as space is limited. When you register/pay for the remaining classes, a Zumbini® Bundle will be ordered for you! Zumbini® Friend Bonus - When you and a new Zumbini® family registers/pays for a semester, each of you will receive $15 off. The same offer applies for two new family friends that register/pay within 24 hours of their FREE class. Contact Sunshine Family Yoga for your bonus code, before you complete your on-line registration and payment. Partial Scholarships Available - The Zumbini® Bundle is an important part of overall Zumbini® class experience, increasing class cost. Understanding this may keep some from enjoying this unique family offering, Sunshine Family Yoga is extending this offer. Contact Sunshine Family Yoga for information. Register & Pay Here to Attend Class!